I meant to do a post and my usual blog hop today, but it just isn’t happening. We were in Istanbul, and now my sister is visiting us in Israel and I just want to enjoy every single second with her. Today I took her to the Dead Sea, the lowest point on Earth, and got to watch as she floated, completely weightless, in its magical waters for the first time. Now we’re off to a barbecue with some friends. I promise that Monday I’ll be back to normal with delicious recipes, tales of my travels, and my regularly scheduled programming. I miss your blogs and have a lot of catching up to do. I also have to finish pinning from last week’s blog hop, which is why I decided not to do one this week. I dropped the ball there, but I promise I’ll be back on track. 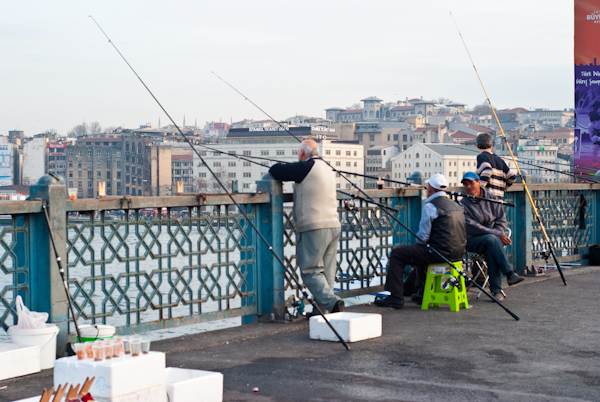 In the meantime, here is a photo of people fishing off the Galata Bridge in Istanbul. Have a great weekend! That is one of the places I most want to see – The Dead Sea. Enjoy your visit and adventures!!! Sometimes we have to take a break and enjoy life. I had to take a step back from the blogging world this week. We’ll all be here after you come back from spending time with your family. Have fun Katherine. Time off is good for the soul! Katherine, you work incredibly hard and deserve some time off. I look forward to your next post – but am glad you’re taking some personal time. Sounds like you’re having a great time! Enjoy your well deserved break with the fam! will be looking forward to ur next post..